Blood, 2018, 131(4):397-407. Romidepsin (FK228, Depsipeptide) purchased from Selleck. PBMCs from a patient were incubated with diverse agents (2 μM Compound E, 2 nM Bortezomib and 1nM Romidepsin) for 48 hours. Apoptosis detection was performed by Annexin V/PI staining and analyzed by flow cytometry. Annexin V+/PI− (lower right quadrant) areas stand for early apoptotic cells, and Annexin V+/PI+ (upper right quadrant) areas stand for late apoptotic or necrotic cells. Leukemia, 2015, 29(3):556-66. Romidepsin (FK228, Depsipeptide) purchased from Selleck. Effects of combination of bort/romidepsin on HDAC6 inhibition and activation of ER stress signaling. HA cells were treated with combination of 15 nM bortezomib and 5 nM romidepsin or either drug alone for 24 hr. Expression of CHOP/GADD153 (green signals) and cleaved PARP (red signals) was detected by immunoﬂuorescent staining. DAPI (blue signals) stained the cell nuclei. Int J Cancer 2014 135(12):2950-61. Romidepsin (FK228, Depsipeptide) purchased from Selleck. An HIV-Gag-SLYNTVATL-specific CTL clone was labeled with Alexa-Fluor555 conjugated cholera toxin subunit B either cultured with 500 nM SAHA or 25 nM romidepsin for 20 hours, or maintained as an untreated control. These effector cells were combined with SLYNTVATL peptide pulsed target cells, matched on the restricting allele, in a collagen matrix medium containing sytox green viability dye. These mixtures were then plated in three separate wells of an 8-well cover slip and imaged by time-lapse brightfield and fluorescent microscopy. A. Shown are representative fields of view from the no treatment (upper panel), 500 nM SAHA (middle panel), and 25 nM romidepsin (lower panel) conditions advancing in time from left to right. Time stamps are given in hh[ratio]mm format. Clones described in the results are indicated with yellow arrows and killed target cells are indicated with white arrows in the upper right panel. PLoS Pathog 2014 10(8), e1004287. Romidepsin (FK228, Depsipeptide) purchased from Selleck. PLZF-RARa–nonexpressing and -expressing PLZFRARβ3 cells were treated with 5 nmol/L romidepsin for the indicated time points. Induction of the DNA DSB marker γH2AX was measured by Western blotting. β-Actin was used as a loading control. Mol Cancer Ther 2013 12(8), 1591-604. Romidepsin (FK228, Depsipeptide) purchased from Selleck. Impacts of chromopeptide A and FK228 on G2/M transition regulators. PC3 and LNCaP cells were treated with chromopeptide A or FK228 at indicated concentrations for 24 h, and cells lysates were immunoblotted with the indicated antibodies. Acta Pharmacol Sin, 2017, 38(4):551-560. Romidepsin (FK228, Depsipeptide) purchased from Selleck. More effective than other classical HDAC inhibitors such as TSA, TPX, and butyrate. For the enzyme assay, 10 μL of [3H]acetyl-labeled histones (25,000 cpm/10 μg) are added to 90 μL of the HDAC enzyme fraction extracted from 293T cells overexpressing HDAC1 or HDAC2 in the presence of increasing concentrations of Romidepsin, and the mixture is incubated at 37 °C for 15 minutes. The enzyme reaction is linear for at least 1 hour. The reaction is stopped by the addition of 10 μL of concentrated HCl. The released [3H]acetic acid is extracted with 1 mL of ethylacetate, and 0.9 mL of the solvent layer is taken into 5 mL of aqueous counting scintillant II solution for determination of radioactivity. The IC50 values are determined from at least three independent dose-response curves. Cells are exposed to various concentrations of Romidepsin for 72 hours in 96-well plates. 20 μL of 5 mg/mL MTT solution in PBS is added to each well for 4 hours. After removal of the medium, 170 μL of DMSO is added to each well to dissolve the formazan crystals. The absorbance at 540 nm is determined. In addition, cells are incubated with trypan blue, and the numbers of blue (dead) cells and transparent (live) cells are counted in a hemocytometer. For cell cycle analysis, cells are incubated for 30 minutes in propidium iodide staining solution containing 0.05 mg/mL propidium iodide, 1 mM EDTA, 0.1% Triton X-100, and 1 mg/mL RNase A in PBS. The suspension is then passed through a nylon mesh filter and analyzed on a Becton Dickinson FACScan. Furumai R, et al. Cancer Res, 2002, 62(17), 4916-4921. Sandor V, et al. Br J Cancer, 2000, 83(6), 817-825. Blagosklonny MV, et al. Mol Cancer Ther, 2002, 1(11), 937-941. Kwon HJ, et al. Int J Cancer, 2002, 97(3), 290-296. Sasakawa Y, et al. 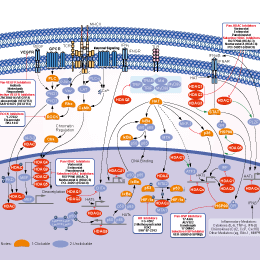 Biochem Pharmacol, 2002, 64(7), 1079-1090. Aron JL, et al. Blood, 2003, 102(2), 652-628. Lundqvist A, et al. Cancer Res, 2006, 66(14), 7317-7325. Dai Y, et al. Clin Cancer Res, 2008, 14(2), 549-558. Paoluzzi L, et al. Clin Cancer Res, 2010, 16(2), 554-565. 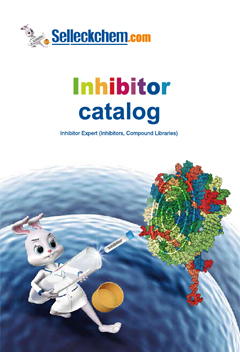 Panobinostat (LBH589) : Pan-HDAC inhibitor, IC50=5 nM. Quisinostat (JNJ-26481585) : HDAC1, IC50=0.11 nM; HDAC2, IC50=0.33 nM. Vorinostat (SAHA, MK0683) : Approved by FDA against cutaneous T cell lymphoma. RG2833 (RGFP109) New : Brain-penetrant HDAC inhibitor with IC50 of 60 nM and 50 nM for HDAC1 and HDAC3, respectively.